Today in the exhibition centre "Michailovsky Manege" the Week of chemical technologies will start. The purpose of week of chemical technologies is, first of all, the aspiration to present modern Russian and foreign technologies in the field of chemical manufacture, to discuss modern condition and prospects of development on the market of chemical and petrochemical products, aspects of quality, economy and ecology. 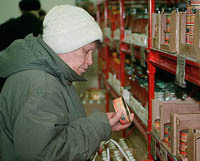 For the “ordinary consumer" in the framework of the Week of chemical technologies II International exhibition "Household chemical goods-2002" is held. Expositions of this exhibition should help to the consumer to understand constantly extending assortment of household chemical goods. Also in the framework of the Week of chemical technologies III Congress of chemical technologies and 3 specialized exhibitions (III international specialized exhibition "Himexpo-2002", V the International specialized exhibition "Plastexpo-2002" and IV International specialized exhibition " Varnishes and paints - 2002 ") will be held.